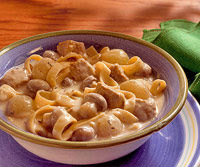 Veal and mushrooms are served in a flavorful sauce of beef broth, wine, and evaporated milk. Ladle this low-fat veal stew over noodles. Trim separable fat from veal; cut veal into 1-inch pieces. Lightly coat a 3-quart saucepan with cooking spray. Preheat saucepan over medium heat. Brown veal, half at a time, in hot saucepan. Return all veal to saucepan. Add beef broth, wine or water, thyme, salt, and bay leaf. Bring to boiling; reduce heat. Cover and simmer for 45 minutes. Halve any large fresh pearl onions. Stir fresh or frozen onions and mushrooms into veal mixture. Return to boiling; reduce heat. Cover and simmer for 15 minutes more or until onions and mushrooms are tender. Combine evaporated skim milk, flour, and nutmeg. Add to veal mixture. Cook and stir until thickened and bubbly. Cook and stir for 1 more minute. Remove from heat. Discard bay leaf. Stir in noodles and lemon juice. Makes 6 servings. Calories 339, Total Fat 9 g, Cholesterol 94 mg, Sodium 410 mg, Carbohydrate 34 g, Protein 27 g.
This entry was posted on 2:10 AM and is filed under Gravy . You can follow any responses to this entry through the RSS 2.0 feed. You can leave a response, or trackback from your own site.